In response, protests are being held worldwide to stand against Israel’s repeated violations of human rights. 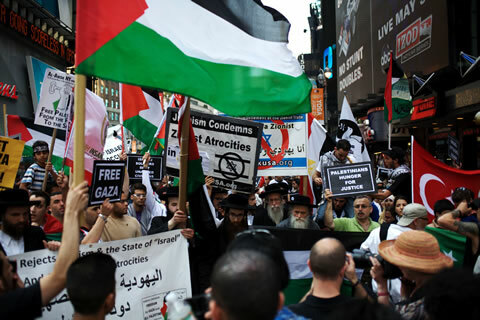 On May 31, more than a thousand protestors gathered in Times Square, which was already packed with tourists, after a call by Palestinian solidarity organizations including Al-Awda NY, the Gaza Freedom March, American Muslims for Palestine, and Neturei Karta. 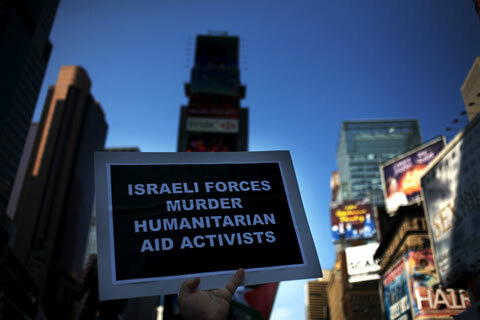 The organizers asked people to call the State Department and Congressional representatives to demand that all aid to Israel, military and economic, be cut off. The NYPD and a special anti-terrorist unit prevented us from marching toward the Israeli embassy. Another protest should take place tomorrow as well. Comrades in Boston report 300 protestors.